Amazon.com description: Product Description: This New York Times bestseller is an exciting and fearless investigation of language from the author of Better Angels of Our Nature and The Sense of Style and Enlightenment Now. Bestselling author Steven Pinker possesses that rare combination of scientific aptitude and verbal eloquence that enables him to provide lucid explanations of deep and powerful ideas. His previous books - including the Pulitzer Prize finalist The Blank Slate -Â have catapulted him into the limelight as one of today's most important popular science writers. 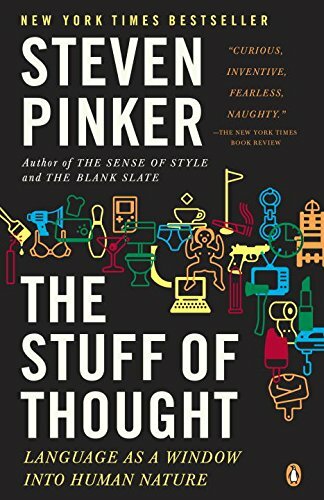 In The Stuff of Thought, Pinker presents a fascinating look at how our words explain our nature. Considering scientific questions with examples from everyday life, The Stuff of Thought is a brilliantly crafted and highly readable work that will appeal to fans of everything from The Selfish Gene and Blink to Eats, Shoots & Leaves. About: Presents a study of the relationship between language and human nature, explaining how everything from swearing and innuendo to prepositions and baby names reveals facts about key human concepts, emotions, and relationships. About: This New York Times bestseller is an exciting and fearless investigation of language from the author of Better Angels of Our Nature and The Sense of Style and Enlightenment Now.